Ever since Jio marked its aggressive entry into an already competitive market last September, many incumbent players have revised their data tariffs and even introduced new aggressive plans to protect their market share. Reliance Industries chairman Mukesh Ambani last month announced the launch of a new 4G-enabled feature phone called JioPhone. Aiming to capture a bigger pie of the 50 crore feature phone market, JioPhone will come with free voice calls and unlimited data in a plan priced at Rs 153 a month. Offered at an "effectively free" cost, customers will have to pay a security deposit of Rs 1,500 which is refundable after three years on return of the device. Will JioPhone be a game-changer for Jio? Some analysts expect JioPhone to boost Jio's profitability due to its aggressive tariff and the 'refund' offer. Deven Choksey, MD of KR Choksey Securities, told NDTV: "Important aspect is about how the entire business is moving as far as telecommunications is concerned. There is a technology which they have adopted which is allowing them to combine the data and voice together. That is basically, I think, quite advanced and disruptive too in nature at the same time. Disruptive more because ultimately it is going to result into voice being made free completely in the system, which is the current revenue model of most telcos (telecom companies)." Listing some of the key challenges before Jio's competitors, Mr Choksey said: "On one side you require hard infrastructure to be built in and on the other side, your revenue model is gone." Describing the JioPhone as an upgrade for those currently using handsets with basic features only for the purpose of calling, A K Prabhakar, head of research at IDBI Capital Market, said: "Jio's target audience is slightly different... If you notice, it (JioPhone) is a very basic phone for 4G. You can use it only for a few things." "Now it comes at zero cost effectively. People will go for it." Mr Ambani in his address to RIL shareholders on July 21 said: "There are 78 crore mobile phones in India. However, let us not forget that in this 78 crore, there are more than 50 crore feature phone users who have been left out of the digital revolution. They cannot avail any benefits of a smartphone, much less the benefits of a 4G LTE smartphone... Jio is committing to end it today." The JioPhone is widely expected to boost Jio's presence in the entry-level phone segment as well as the company's revenue market share and profitability in the long run. Reliance Jio's latest offering - a low-cost 4G-enabled phone - should help reverse the recent decline in telecoms industry revenue, global ratings agency Fitch Ratings has said. Reliance Jio is likely to gain revenue market share "as the new handset allows it to attract first-time 4G users". According to Mr Choksey of KR Choksey Securities, around 30 crore customers in India, who contribute to the lower segment of revenue, have the potential to generate a revenue book of around Rs 1,35,000 crore (including JioPhone and TV cable). "This is something which is completely unparalleled." 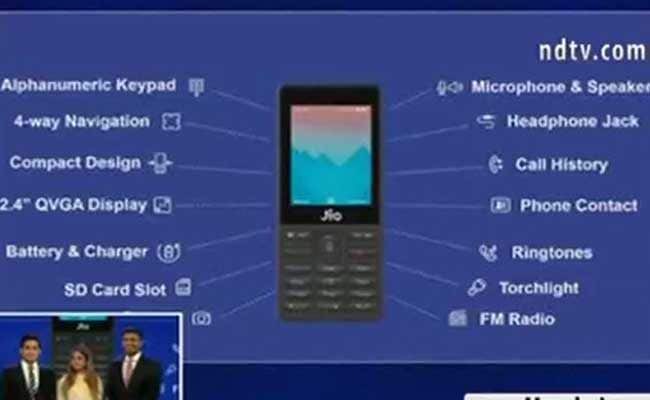 Jio has also announced a 'JioPhone TV cable', which can be connected with any television set to view content on the TV screen. Mr Prabhakar of IDBI Capital Market says JioPhone will help Jio penetrate deeper into Indian markets. "Anyway Rs 150 a month everybody is paying on telecom. Now you are getting internet for it with the phone also in your hand. People who are on the borderline would like to upgrade," he said. Other telecom operators could also follow the JioPhone model and launch such low-cost handsets in association with handset manufacturers, Mr Prabhakar added. "That is very good for the market. The telecom companies can bring its (handset) costs down."